Bad Cabbage with a Side of Slaw: Another effect of global warming? Another effect of global warming? People, you don’t bite into the frozen Twix Java; it won’t let you. You grip it with your teeth, apply a slight amount of upward or downward force to the excess part of the bar with your fingers, and the Twix snaps clean. The cross-section is smooth like a small block of dark, polished shale. The freezing process has little effect on the shortbread cookie. It will still dissolve with saliva or crumble between your teeth and the dollop of hard caramel if you let it. But your teeth will not enter the caramel so easily. There will be resistance. It will be hesitant and say, No. Timeout. I’m not ready, yet. The caramel will warm and get softer, your teeth will sink and settle, its apprehensions will begin to ease up. You’ll begin to chew, and this is when you’ll experience the frozen pull. The caramel will find comfort in the warmth of your mouth and release its coffee flavor. It will relax. It will stick to your teeth and stretch out like taffy on a pull in a candy shop window. Each remaining bite will have a similar effect. Due to the volume of the caramel, it won’t thaw quickly. You’ll have time to enjoy. Unfortunately, Ms. Joseph might never have the chance to experience this treat. She suffers from a condition known as candy consumption haste (CCH). CCH has been known to cause a dislike of white chocolate and cereal dust. In one rare case, a person was said to have given an entire box of Twix Java bars to David Clisbee when he didn’t even ask for them. CCH can do that to you. If you would like to help Diana Joseph combat CCH, donations can be made to the ISYFTW foundation. With every donation, Diana will come one step closer to achieving the dream of experiencing the Twix Java the way God intended it. Frozen. Rumor has it that if you act now, you may be eligible to receive an ISYFTW foundation tote with your donation. They can be used to carry around your candy stash—or any kind of stash, for that matter. But know this: the Twix Java is a limited edition candy bar. You may just run out of time. You should go bury one in the snow in her front yard, but don't tell her you did it. Give it a day or two to freeze, then tell her. Or, better yet, give a cryptic message that will lead Ms. Joseph on a scavenger hunt through the snow! I'm not sure who's responsible for it, but there's some sort of treasure hunt that goes on around these parts. Medallions are buried in snow and clues are administered (online? on tv?) as to the whereabouts of the treasure. I saw something about it on the news. 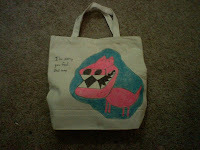 Mr. D. E. DeWolf, I suspect you want an I'M SORRY YOU FEEL THAT WAY tote of your very own. I'm thinking maybe this is your way of asking. I've got one in the works with your name on it, and I will try not to make it as girly as the one Luke Rolfes got. I will try. I wish Clisbee would be bring me Twix Java RIGHT NOW but since he seems unable to read my mind, I'm thinking about whipping up a batch of chocolate buttercream frosting and eating it with a spatula. PS: I think Steve Almond would be LOVE your post. DeWolf! This is Clisbee, Czar of the Java Twix Hord, Pirate of the secret treasure chest of gooey goodness known as the Java Twix bar. Three minutes ago, I place three of the remaining 33 Java Twix into my freezer. At Mizz Joseph's suggestion, I will come to Contemporary Prose packing the frozen yummy-ness. You shall have a frozen Twix Bar by the good graces of Don Joespeh. I shall deliver the goods upon seeing you at 4:00 p.m. central time. One word of advice when eating the frozen TJ, take your time. If you sink your teeth into it and chomp away, it will be like eating a Skor or Heath bar.